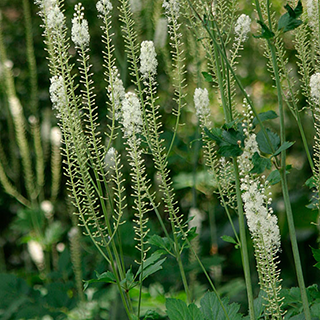 Originally found in Canada and the eastern parts of the US, black cohosh was a favourite remedy with Native Americans. Black Cohosh is used for allaying symptoms related to PMS and menopause. The herb is specific for treating rheumatic pain or other dull, aching body pains as well as tinnitus (ringing in the ears). It can have an antidepressant effect especially for elevating heavy , dark, oppressive moods. Some cases of liver damage have been reported, and it is restricted in some countries. Take 20–40 drops in a little water 3 times daily for period pain; combine with an equal amount of motherwort tincture and take 3 times daily for hot flashes, night sweats, and emotional upsets associated with menopause. Take 20 drops 3 times daily with an equal amount of valerian to support treatments for high blood pressure. Use 1/2oz (15g) of the root in 1 1/2 pints (900ml) of water simmered for 15 minutes—twice daily for rheumatic pains, lumbago, facial neuralgia, sciatica, or tendonitis. Use for menopausal problems or rheumatic disorders; follow dosage directions on the pack. It is best not to take more than 40–80mg daily. Combine 1 cup of a decoction (made as above) with 1 cup of sugar or 3?4 cup honey, bring to the boil, and simmer gently for 5–10 minutes to make a syrup. Take in 1 tsp (5ml) doses every 2–3 hours for whooping cough and bronchitis. Prefers moist, fertile soil in dappled or partial shade. Sow ripe seeds in a cold frame and transplant to 3.5in (7cm) pots; plant in final positions in late spring. Dig mature roots during dormancy in the autumn and use fresh or dried.